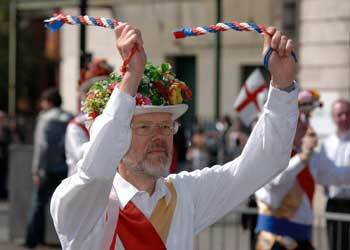 Our apapearance in the St. George's Parade in Manchester city centre was followed by a spot of dancing at The Angel pub. The photos below were taken by two of the spectators, and appear here with their permission. Many thanks to Marcia and Gary for letting us use them. The photos above are copyright of Marcia Petterson and must not be used in any form or altered in any way without her prior permission. where we were well looked after by chef Robert Brown and his team. Many thanks to all the staff there.